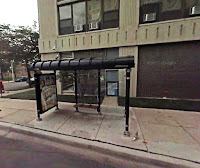 "A [dark blue sedan, with three men inside] traveling East on Wilson fired 2 shots at a gang-banger standing at the bus stop on the SouthWest corner. The intended target was not hit. The bus stop itself wasn’t so lucky. It took the bullets and glass shattered everywhere. The target took off running with gun in hand, trying to chase down the drive-by car as it continued East on Wilson before turning onto Marine Drive. When he realized a police SUV was chasing him, he changed direction and started running South on Clarendon. An officer heard the shots from where she was, nearby, and got there in time to see the intended target chasing the car that shot at him. Fortunately, the police caught him and found the gun which he tossed into a parked mini-van that apparently was unlocked. 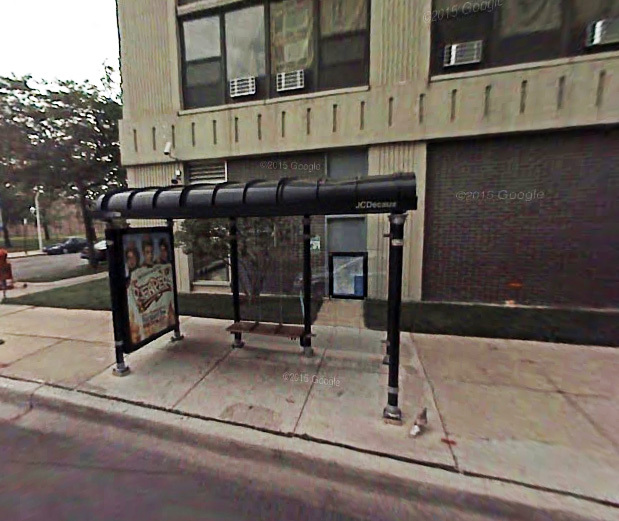 This was the second recent shooting at this bus stop!" There's been a lot of gang idiocy here lately, mostly centered on Wilson. We're not sure what perceived slight these individuals have their feelings hurt over, but daylight shootings on arterial streets are the last thing this community needs. The bus shelter that got shot up is heavily used. In the Google Streetview scenes we took it from, it was occupied by people waiting for the bus in nearly every instance over the years. We shudder to think what may have happened if someone was sitting in it Sunday afternoon. But that's the thing about the gang idiots -- they don't care. They don't care about hurting innocent bystanders; they don't care about the community they claim as their turf; they don't care about anything except exacting revenge on someone who "disrespected" them by walking on the wrong street at the wrong time. It's a pathetic way to live, and we'd feel sorry for them if they weren't acting out with no regard for the well-being of others around them. Go to CAPS if you have any information, and if you aren't comfortable speaking publicly, wait until after the meeting and pull one of the officers aside. The next CAPS meeting for the Clarendon Park area is Wednesday, February 10th, at 7pm, at the Clarendon Park Fieldhouse, Sunnyside & Clarendon. I usually get off at the Lawrence Redline stop. Friday I had to run an errand so I used the Wilson stop. Man was I surprised how horrible the Broadway/Wilson corner has remained. We're talking real nasty. If folks think a new station is going to immediately make the corner a hot spot (hot in a good way), they got another thing coming. From the mini-mall @ Magnolia/Wilson East on Wilson to where this shooting was, Wilson is a real sh*t pit. 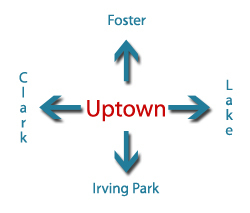 It's going to take a lot more than just an el stop to reverse decades of neglect, enablement, and vice. Until the market for the drugs is removed, they will continue to grapple over these city blocks and when the heat is on move deeper into the nooks and crannies of Uptown putting us all at risk. Be on the look out for hoodies tied tightly over the face and fidgety eyes. To ultimately rid our neighborhood of the market, we need to get rid of, or significantly diminish, our abundance of 1/2 way homes, flop houses, mental health clinics, rehab clinics, tent cities, and other types of subsidized housing that provides safe haven to the drug addicts. If there isn't anyone buying, the low-lifes peddling will have to move on. Maybe that's the plan with development, but considering the glut of ingrained filth we all have to contend with daily, that transformation is going to take a long time and we can expect to see many more posts just like this. Hopefully no innocents are hit in the interim. Honestly, I don't think Wilson is as bad as you claim. Between Broadway and Clark it's actually pretty nice. Baker & Nosh, Heritage Outpost, and The Public Barber are becoming Sheridan Park institutions and it's always nice to have a Jimmy John's and a Starbucks as well. Between Broadway and Clarendon it's a little more iffy, but they have Everybody's Coffee and the two new buildings from CedarSt should help as well. The stretch of Broadway adjacent to the Wilson stop isn't great, but given time, I think it'll develop nicely. It's not going to happen as the station is being built, it'll happen after the new station is open. The area around Lawrence isn't much better, especially when you head east toward Clarendon. The market for the drugs is living under the LSD underpasses. In the past five years, the stretch of Wilson from Clark to the Red Line has improved immensely. Baker & Nosh opened and appears to be doing well. Heritage Outpost is now open and the building it's in was fully rehabbed and is now occupied. The strip mall on the corner of Wilson & Magnolia is not nearly as crime-ridden as it once was. Sure it's not a perfect stretch of street, but compared to where it was five years ago, the needle is definitely pointing up. As for the Wilson Red Line stop, we're only a year into a 3-4 year total rebuild of the station. When it's done, we'll have a modern, well-lit, clean station, the likes of which this neighborhood hasn't seen since the 1920s! That'll attract new business to the area, which in turn will increase foot traffic, which in turn will make things safer for all of us in the area. It's not going to happen over night, but there's certainly reason to be optimistic, especially considering that just five years ago the idea of a new Wilson Red Line station was a pie-in-the-sky dream and new businesses were avoiding the area like the plague. Good points, Paul. I'd love to see the strip mall at Magnolia and Wilson get torn down. It's ugly and nothing good ever happens there. It'd be great to see that and the Starbucks building across the way toppled, with something more dense going in. The new building at Clark and Lawrence is a great example of what should go in at both locations. Get some more market-rate apartments in the area. They could be parking-light too, with the beefed-up TOD legislation. Promise Starbucks a prime storefront and they'll come back. Perhaps get a Potbelly and some more local spots and the area could really take off, especially thanks to Wilson station renovation. I like our Alderman too--way better than the last one. I do want to see him get tougher on the free housing advocates who only push for more drug induced gang bangers. Time to move them elsewhere. 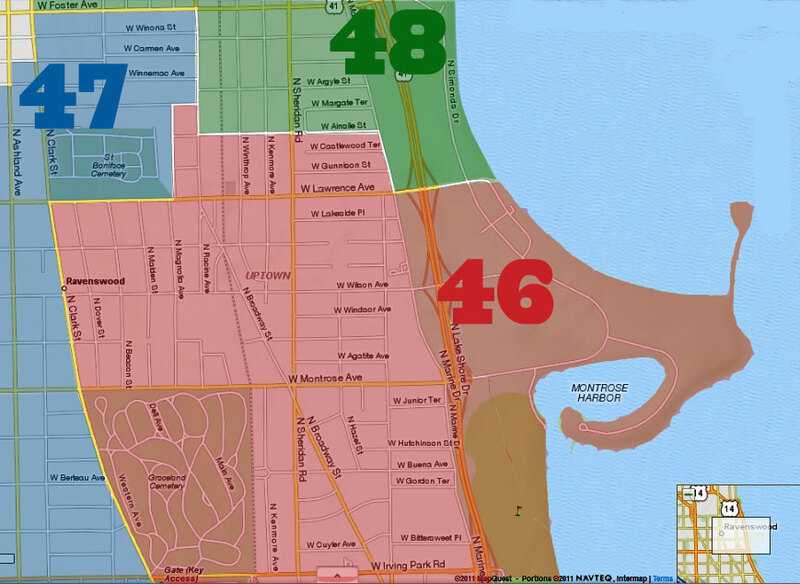 There are obvious hotspots around the neighborhood - Wilson/Clarendon, Broadway/Wilson, and Wilson/McDonalds - yet I never see visible or consistent police presence in any of these areas. And not drive by once in a while, I mean, get out of the car, walk around, chat with people. I can't think of a better deterrent. Just, be there; consistently; and for significant periods of time. And when the criminals move to a different corner, go there too. It doesn't seem like rocket science. Update: last night around 11PM the area around Wilson, Hazel and Clarendon were being heavily patrolled by police in marked and unmarked squad cars. I had come home late and was looking for a parking spot and as I was driving around I saw them practically everywhere. Who knows how long this will last but for now I feel a whole lot safer! Really hope that continues. I see significantly more police presence in Lakevew East than I do here. Significantly more. It's time for them to step it up over here. Having more police around is definitely a step in the right direction, although it did not seem to deter another shooting in the neighborhood yesterday evening. See the link below. Where's our Alderman and his candid response? Great how we added on these high-tech expensive camera's. Camera's aren't any good if the judges don't enforce the penalties. What happened to all the extra cops promised in return for a positive vote from Cappleman to increase our property taxes?